Melanoma is increasing in incidence and remains a major public health threat. Although the disease may be curable when identified early, advanced melanoma is characterized by widespread metastatic disease and a median survival of less than 10 months. In recent years, however, major advances in our understanding of the molecular nature of melanoma and the interaction of melanoma cells with the immune system have resulted in several new therapeutic strategies that are showing significant clinical benefit. Current therapeutic approaches include surgical resection of metastatic disease, chemotherapy, immunotherapy, and targeted therapy. Dacarbazine, interleukin-2, ipilimumab, and vemurafenib are now approved for the treatment of advanced melanoma. 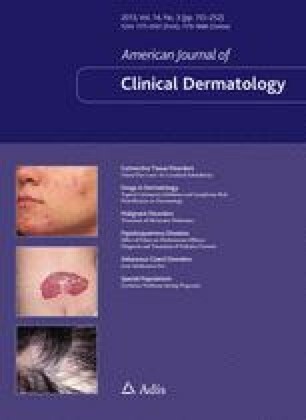 In addition, new combination chemotherapy regimens, monoclonal antibodies blocking the programmed death-1 (PD-1)/PD-ligand 1 pathway, and targeted therapy against CKIT, mitogen-activated protein/extracellular signal-regulated kinase (MEK), and other putative signaling pathways in melanoma are beginning to show promise in early-phase clinical trials. Further research on these modalities alone and in combination will likely be the focus of future clinical investigation and may impact the outcomes for patients with advanced melanoma. No sources of funding were received to prepare this article. The authors have no conflicts of interest that are directly relevant to the content of this article.